A LITTLE CYCLE AROUND THE SCOTTISH HIGHLANDS TO TEST KIT FOR THE SLOW RACE. We didn’t have The Slow Race Surly Disc Truckers at this point. Dan: Surly Long Haul Trucker with V brakes and a triple chainset. Carried two rear panniers, rack pack and handle bar bag. Jen: Felt V85 with disc brakes and compact gears (struggled/pushed up some hills). Carried two rear panniers, plus sleeping bag and food bag on rack. 16 days (includes 2 days’ travel). 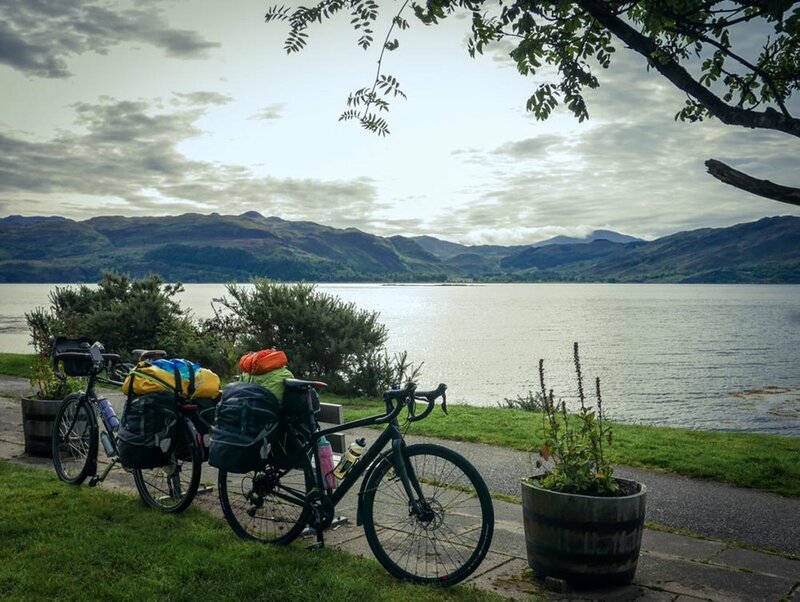 The standard route is a 500 mi coastal loop around the Scottish Highlands. We made a couple of detours. Depending on how long you have, the NC500 can be broken up as you please, as there’s accommodation dotted all around the circuit. A friend of ours, who’s a pro cyclist, cycled it in 5x 100 mi rides. Mental. We couldn’t even fathom doing that. Below is how we broke it up. Early morning train from London King’s Cross to Inverness (8 hours). Includes Bealach na Bà pass (626 m / 2,054 ft). Wild camped at a lookout point, which had public toilets and a picnic area. This is a detour off the standard NC500 route. Stayed in Kearvaig Bothy. You need to take a ferry from Cape Wrath to get there. Usually found in remote places, bothies are old, disused farm buildings, which have been restored for people to use free of charge. Note: you can’t drive to these places, you have to hike or cycle there. This is a detour off the standard NC500 route. The A9 is a hectic road, so we opted to head towards Cromarty and take a car ferry to the Black Isle, which is popular for dolphin spotting. Caught an afternoon train from Inverness to London King’s Cross (8 hours). August/September 2017 (pre-The Slow Race). Surprisingly warm. We cycled in shorts the whole way and only occasionally wore a jacket. There were a couple of rainy days and one severe storm, but it stayed dry for most of the trip. Watching dolphins on the Black Isle. 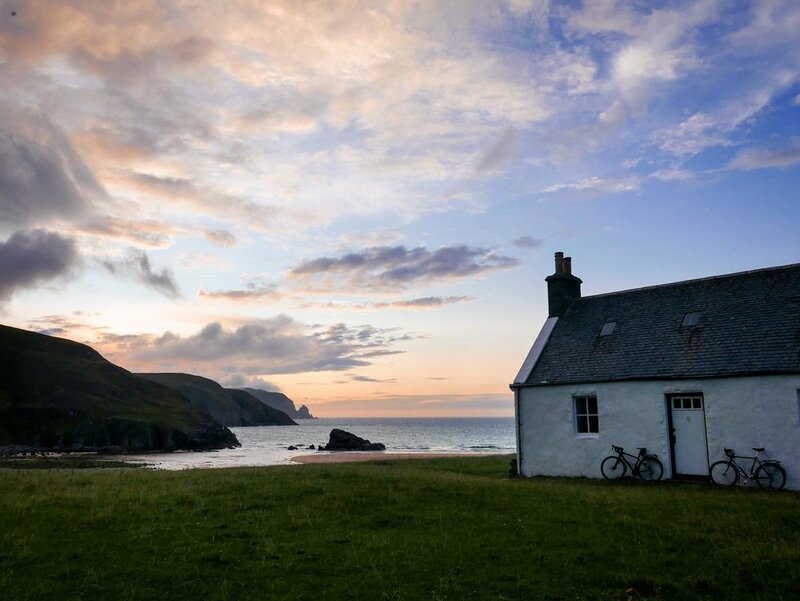 Kearvaig Bothy with its secluded beach. Rock Rose Gin Distillery in Dunnet. We pretty much cooked all meals. There were supermarkets in nearly every village, and definitely in every town. We did occasionally treat ourselves – mostly to beer. You have to try the local seafood, especially the salmon, it’s incredible. We filled up at campsites and restaurants. We brewed our morning coffee, then always managed to find a cafe for an afternoon pick-me-up. Prices were reasonable. We used roughly 1.5 L of Coleman fuel during our trip, which included cooking up to two meals a day and brewing morning coffees. There’s everything from super-budget camping in a tent, to very high-end hotels and home stays – and everything in between. Most people we met on the route were in motorhomes. We will say that the midges made camping rather unenjoyable on the west coast. As soon as the sun went down, they came out in force. In Kinlochewe they were particularly bad – apparently worse than usual. We were banished to our tent for the whole evening. In more windier west coast locations, like Durness, midges weren’t such a problem. Wild camping is legal in Scotland. Usual wild camping rules apply: away from homes, no littering, leave it as you found it, be considerate, etc. 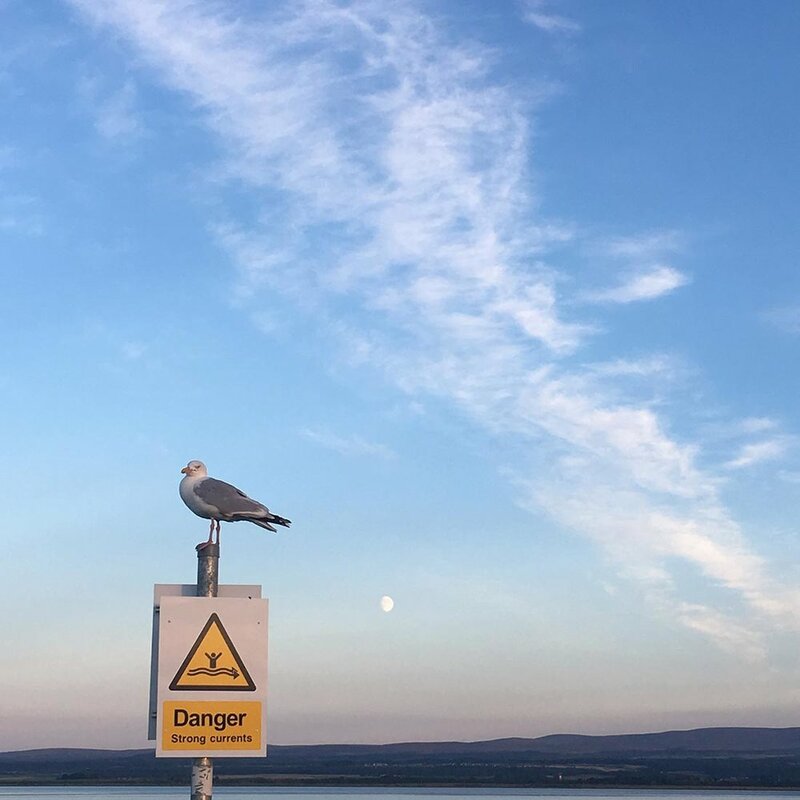 The east coast is much flatter and becomes very busy very quickly, as the A9 is the only major road connecting The Highlands to Scotland’s major cities. We decided to leave the A9 at Tain (at Lidl) and head towards the Black Isle. This route takes you through smaller villages before you take a car ferry from Cromarty. Drivers were extremely considerate on Bealach na Bà pass, often waiting for us to (slowly) pass them before they moved. This was the case for most of the west and north coast. Drivers on the east coast, however, were in more of a hurry. There were some close calls as they passed us. We didn’t need a bike shop per se. When we were in Ullapool, a screw on Jen’s Tortek rear rack snapped, leaving the body of the screw in the bike frame. The local car garage helped us hammer the screw out. For peace of mind, and because Jen was now missing a screw, we swapped all of her rack screws for stronger spare ones off Dan’s Surly (he didn’t get the screws back until Jen came to sell the bike 6 months later). We caught a Virgin Trains East Coast train direct from London King’s Cross to Inverness, which took 8 hours and cost £134. This line has now changed to London North Eastern Railway (and it’ll probably change again…). We set up a ticket alert so we could book the tickets as soon as they were released, guaranteeing the cheapest price. Don’t forget to reserve a bike spot – there were only three spots available. It didn’t cost extra for bikes. Visit Scotland NC500 – Useful info on the full route. 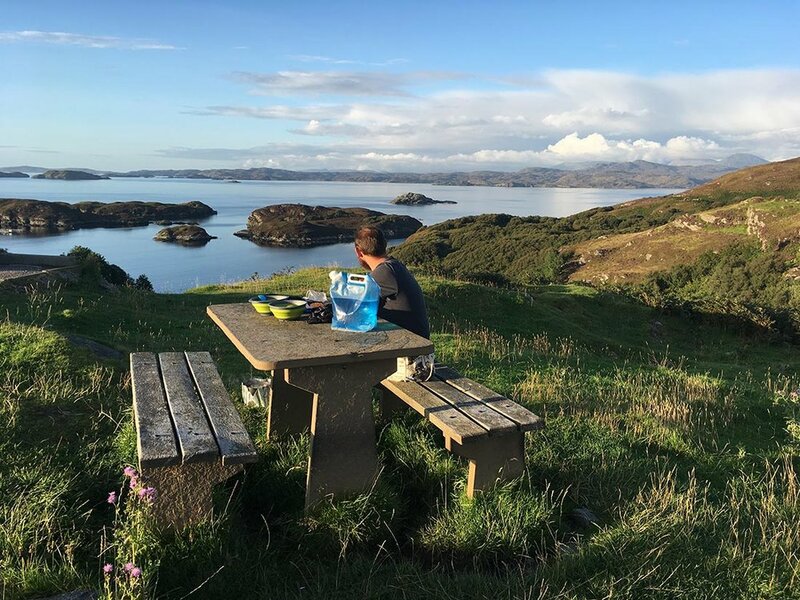 The official NC500 website now charge you for info packs. Big Ride: Bealach Na Bà – Detailed article on climbing Scotland’s third highest pass. Be prepared for the midges. Apparently Avon Skin So Soft repels them. Some Highland shops sell it. Also bring a face net – they really can be that bad. Have some buffer days. 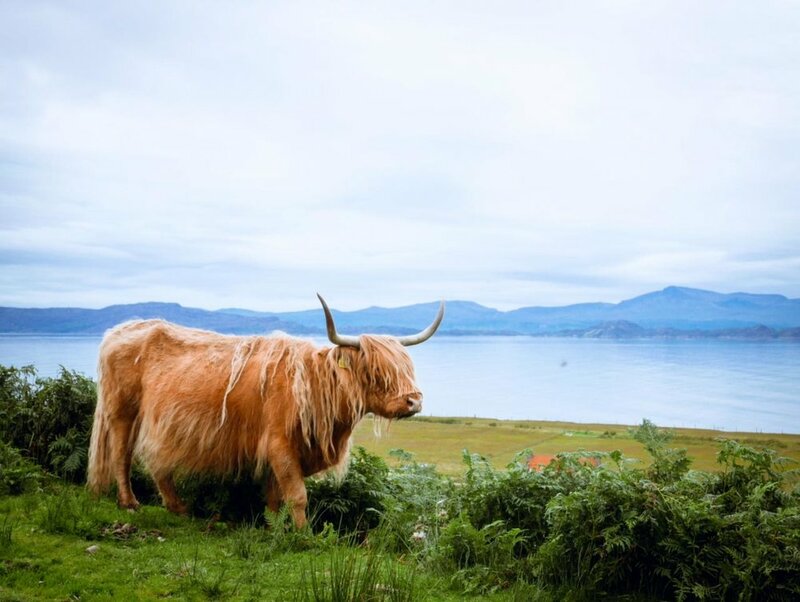 You may hit the wall and have to cut a ride short, there may be severe weather – we got caught in a storm at Durness – or you might just want to spend an extra day in a lovely Highland town. Whatever the reason, it’s worth having some spare time. Pack light. You are going to want your bike to be as light as possible when you’re crawling up some of the inclines The Highlands throw at you.